When the old clockwork died the whole thing looked too nice to throw away. Why not put some leds inside and recycle. The clock, now it is 9 hours and 10 minutes and the binary panel shows 3 minutes more, the time is 9:13. Easy to read for us electronic freaks. 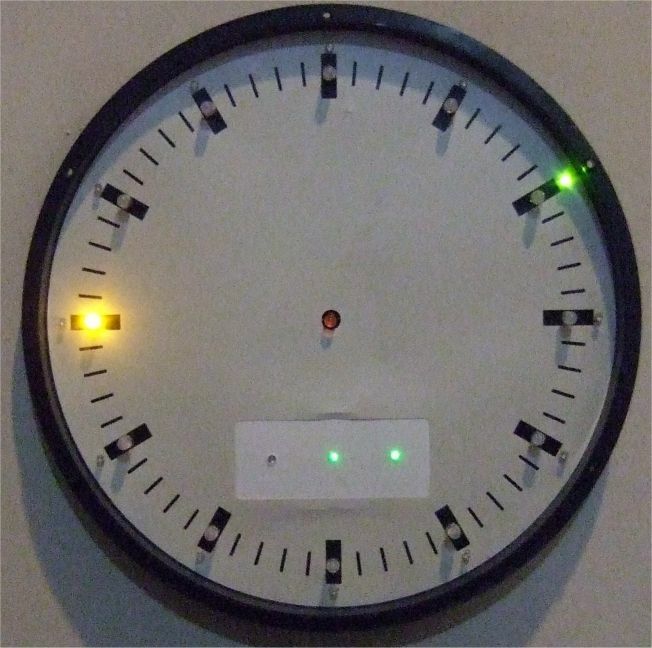 The inner orange leds show the hours, the outer green leds show 5 minutes and the panel below shows minutes 0-4 in binary. Now the challenge was to use one ATtiny 2313 to turn on the 12 hour leds, the 12 minute leds and 3 more on the binary panel. Charlieplexing was the answer, with N pins we can control N*(N-1) leds. Four pins control 12 leds. 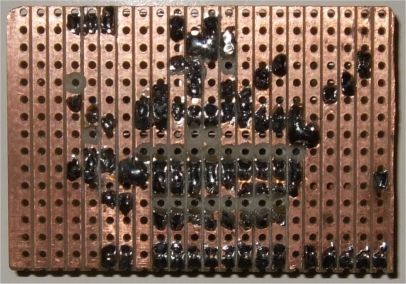 This technique was proposed in early 1995 by Charlie Allen at Maxim Integrated Products. On PORTB the lower 4 pins are assigned to the 12 hour orange leds and the upper 4 pins turn on the green 5 minute leds. The binary panel is conventional 1 pin per led. As a clock it is using a 4 MHz quartz, a small pushbutton is there to advance the time every full hour and a RS232 interface to set the time. It won't send to the PC, receive only to set the time like h21 for the hours or m15 to set the minutes. Backside of the clock, a lot of wiring as you can see. Connecting the leds needs a high level of concentration on a quiet day, there is no margin for error. Troubleshooting in charlieplexed led circuits is not easy. It starts to drill small holes for all the leds and push them in, then bend the wires to keep them in place. Wiring is the next task. 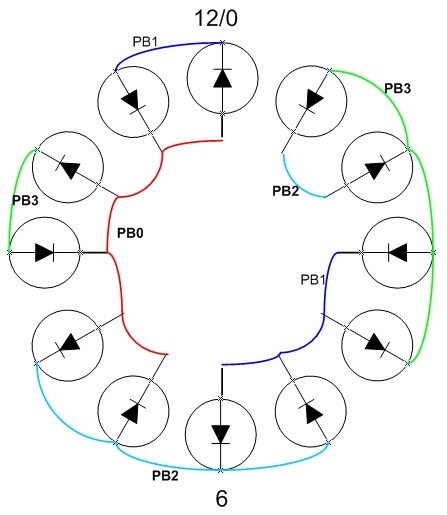 The cicuit diagram, the 12 orange leds are connected to PB0123 and the12 green leds to PB4567. Resistors could be 100 Ohm. 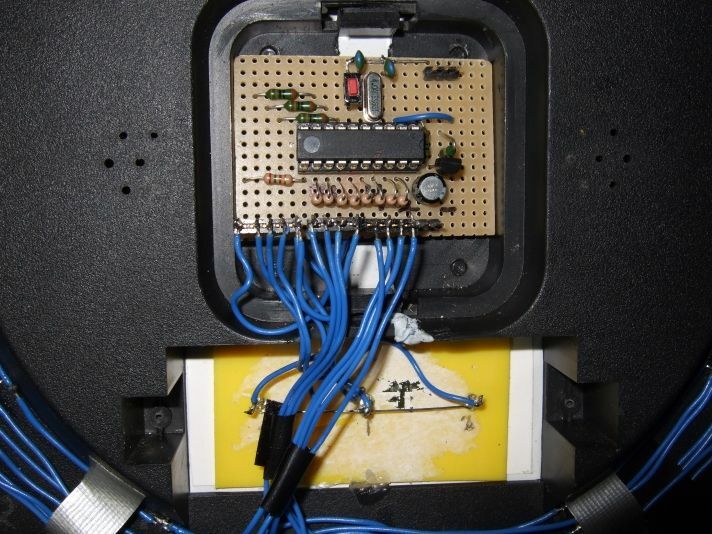 The small binary panel leds are connected to PD5 4 3, the led in the middle of the clock to PIND6, it turns on between 18h and 6h. 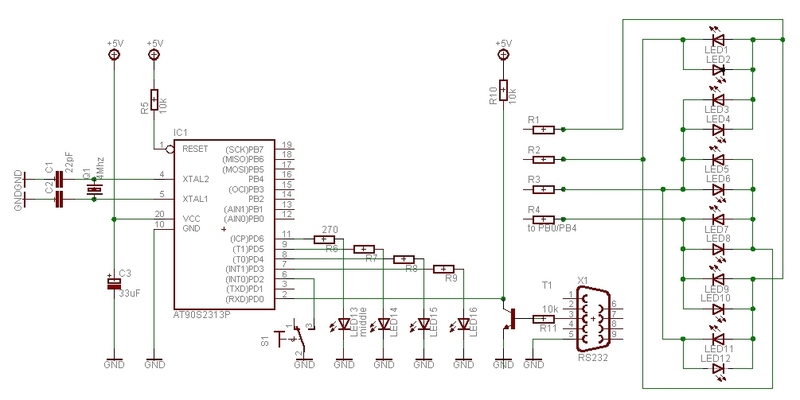 This led is using a 24 h clock, the other leds are on a 12 hour clock timing. The outer green leds flash once every second to show the clock is working. This was the difficult part, now comes the easy part, the assembly of the contoller board. Top and bottom view of the controller board. 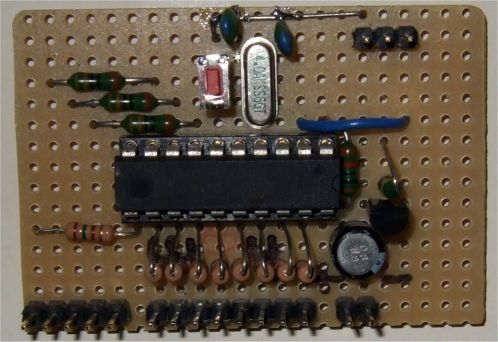 Not many parts needed, the ATtiny2313, a quartz and some resistors. The assembler program uses a table to charlieplex the leds, e.g. .db 0b00110001 where the upper 4 bits are going to DDRB and the lower 4 bits set PORTB. The time is controlled by a Timer1 Compare Match A interrupt which fires every 10 ms, all timing is derived frome here. The External Interrupt0 on PIND2, when S1 pushbutton is pressed, will advance the hour to allow a manual time setting every full hour, otherwise use the RS232 interface anytime. When the power is turned on the clock will do a test of the leds and then starts to show the time. Enjoy. 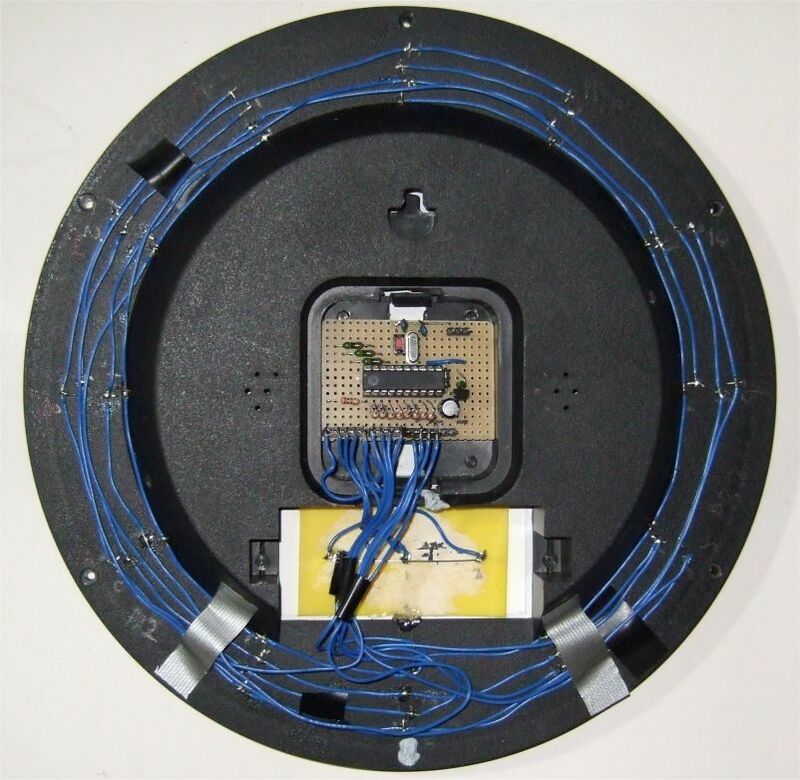 The wiring is a bit complex but finally you'll have a very unique clock.